Did Microsoft just confirm an always-online Xbox 720? It looks like Microsoft will soon be feeling the wrath of a rather angsty gaming community, with the strongest hint so far that an internet connection will be necessary to play games on the Xbox 720. Following Kotaku's revelation that more sources had confirmed an always-online console is on its way, Microsoft Studios' creative director Adam Orth took to Twitter to respond to the groans of the gaming community. 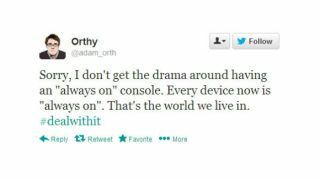 "Sorry, I don't get the drama around having an 'always on' console. Every device now is 'always on'. That's the world we live in." He then signed off with a #dealwithit. Orth then went on to compare running a device with an "always-on" connection to running a vacuum cleaner using electricity. The fact that a Microsoft Studios employee would come out and make a comments like these is the strongest hint yet that an always-online console is exactly what Microsoft is about to unveil. Yesterday, Kotaku cited more evidence that the next Xbox will be always-online, though the console will be able to withstand brief connection drops. Its source explained: "Unless something has changed recently, Durango consumer units must have an active connection to be used. "If there isn't a connection, no games or apps can be started. If the connection is interrupted then after a period of time – currently three minutes, if I remember correctly – the game/app is suspended and the network troubleshooter started." But following the recent SimCity incident that will not be spoken of, the gaming community has made it clear that always-online is not the way it wants to go. While a internet-powered Xbox is looking more likely than ever, there's still no guarantee that previous rumours of the console not being able to play second-hand games have any credence. Especially following Gamestop's recent comments. Since the blow-out, Orth has made his Twitter account private. Do we reckon he got a stern telling-off?